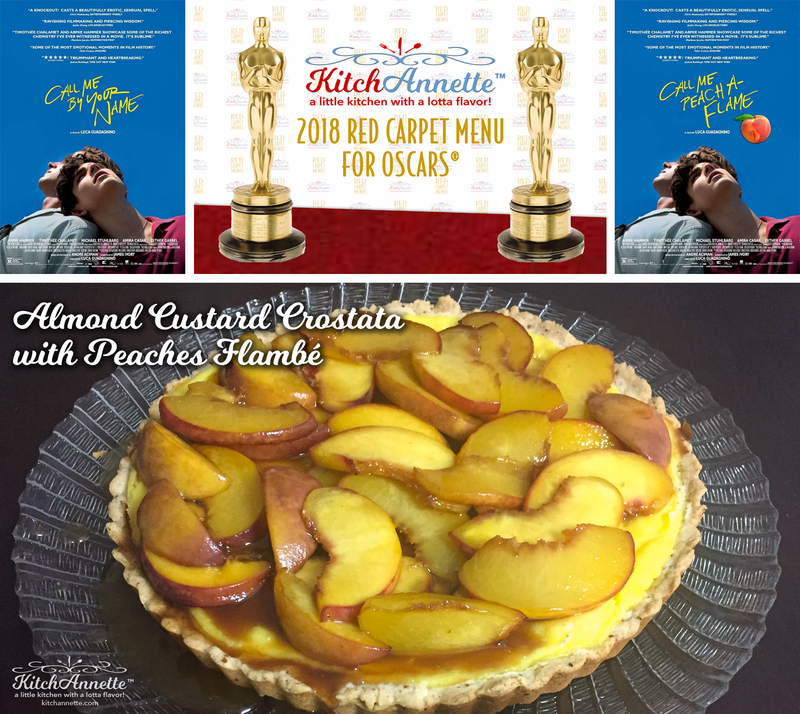 When I think of “Call Me By Your Name”, I “feel” the sun… taste fresh stone fruit right off the tree… dining al fresco… hear ’80’s music… ahhhh… It’s a GORGEOUS film. There were parts that seemed forced but there are such strong moments that stay with you, most especially the final scene. That was INCREDIBLE. As I sit here writing this on Oscar Eve, there are images swirling in my mind from this film. I want to fall into the film and have a summer at a beautiful villa in the Italian countryside. I went to Italy just once when I was quite young so I think it’s time I get back there. When it came to picking a dish for this movie, there was NO DOUBT that peaches would be included… for OBVIOUS reasons. But I wanted it to really pay tribute to this film. A crostata is an Italian open-faced fruit tart. Check. The film took place in Crema – cream – custard. Check. Almond trees flourish in Italy so using them in this dish was perfect. 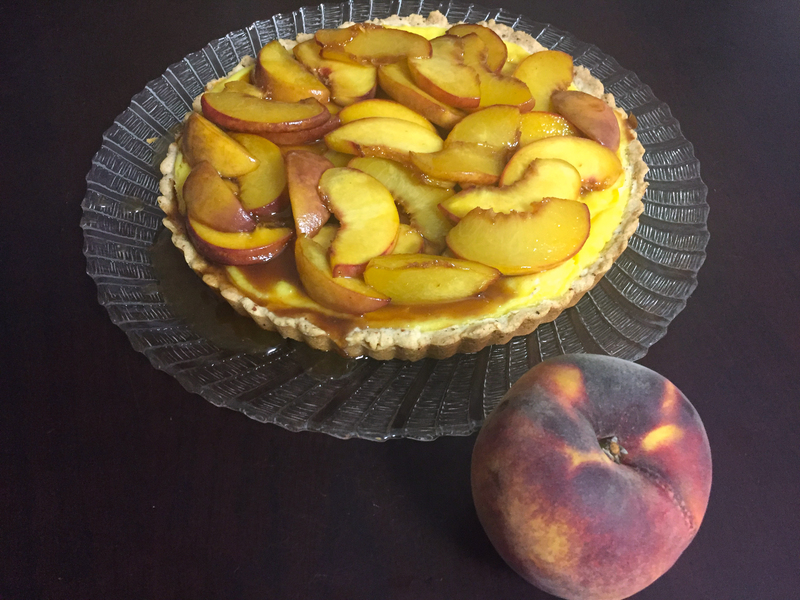 And the flavor of almond and peaches… amazing! This recipe may seem complicated but it’s so easy. I don’t bother with difficult dishes. The custard takes all of 10 minutes to make. While that cools, you swing right into making the crust, which is another 10 minutes. Spread the crust in the pan, spread the custard in the crust, and bake it. 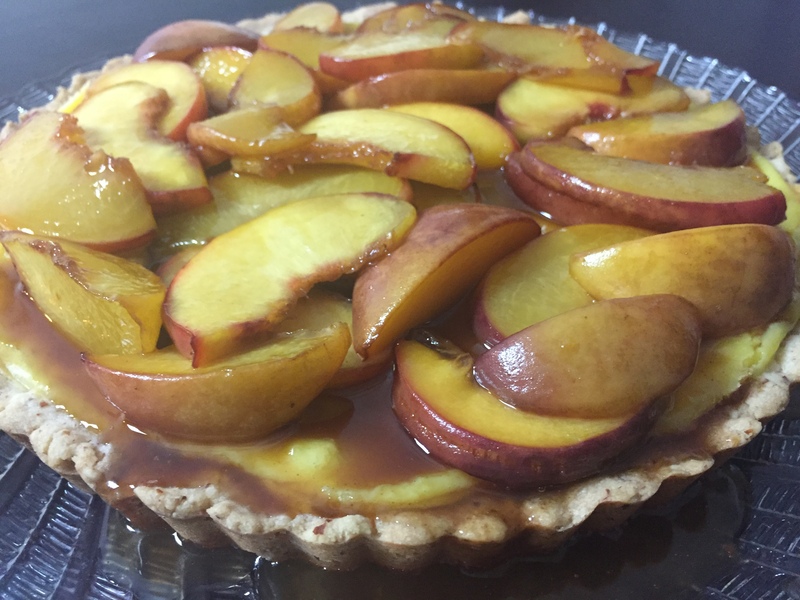 Slice those peaches, throw the brown sugar and butter in a pan, add the peaches… let ’em get a bit soft and pour on the brandy then carefully make ’em A FLAME! Sexily pour them on the cake and you are a dessert HERO! I made it the first time a couple of weeks ago for friends – perfect time to test the recipe! The reaction was incredible. Then I made it again this past week and shared it with other friends. Adored! I just made the custard for the BIG SHOW tomorrow night. Fast and fabulous. I can’t wait to hear the ooohs and aahhhhs. You’ll see… you try it. 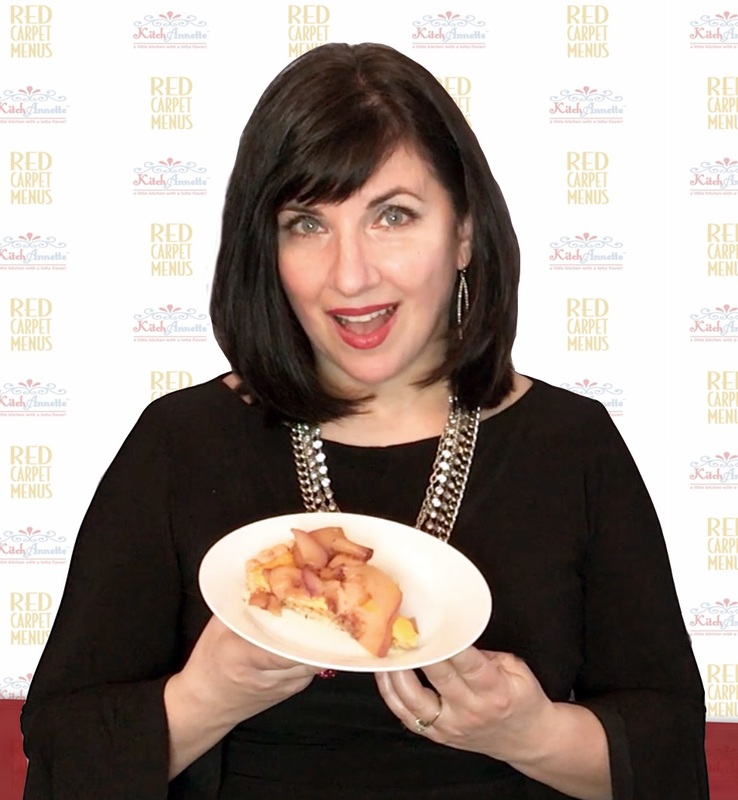 And that is the last recipe for the 2018 Red Carpet Menu! I made it in under the wire again! Now I can “rest” for a few hours before I rev up, cook all the dishes again, and fill up my home with good friends and a great show! Enjoy! Heat milk and lemon zest in a non-stick saucepan over low heat. Whisk egg yolks, sugar and flour in a heat-safe bowl. Add the milk to the bowl, whisking constantly. Pour mixture back into saucepan and, over medium heat, whisk constantly until liquid thickens and comes away from the bottom of the pan. Remove from heat and whisk in extract and cream until well combined. Place in heat-safe bowl, cover with plastic wrap, and refrigerate for 30 minutes, or until cool. Using a mixer, combine butter and sugar until fluffy. Add flour, almond meal, and salt. Mix well. Gather into a ball and press evenly into a 10” fluted tart pan with removable bottom. Set aside. When custard is cool, remove it from refrigerator and spread evenly over the crust. Bake at 325° for 45-50 minutes, or until golden. Remove and cool. Melt butter with brown sugar in a skillet over medium heat. Add the peaches, coating them in the sugar mixture, until soft. CAREFULLY add brandy and CAREFULLY ignite using a torch/long lighter, standing back. Let flames fully diminish and stir peaches. Remove from heat and liberally pour over cake. Serve immediately.